We are excited to announce that the Roadmap for Equitable Economic Development: Expanding the Toolkit of the Community Development Movement was released yesterday by the Association for Neighborhood and Housing Development (ANHD). This report is a must-read for anyone working in community development, at the intersection of housing and economic development, or making and influencing policy decisions in these areas – particularly in New York City. This is the first comprehensive set of neighborhood economic development policy recommendations for New York City’s new administration and is a call to action for coordinated citywide economic development policy. 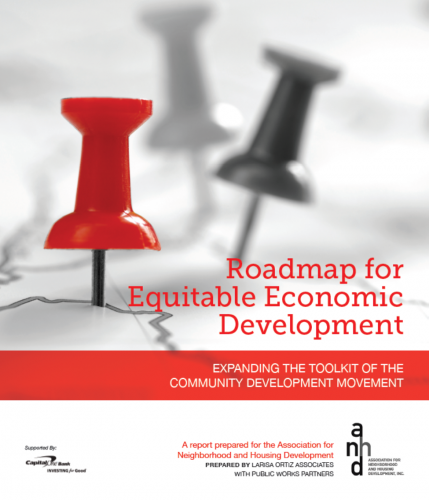 It is the compilation of insight from ANHD members and other key community economic development service providers within the City of New York. The report, which can be downloaded here, and was written by Larisa Ortiz and Nicole Leighton of Larisa Ortiz Associates, and Mark Foggin of Public Works Partners. Barika X. Williams and Benjamin Dulchin, and the staff and board of ANHD were the driving forces behind this work. Equitable economic development has often been distinct from housing production. Economic development planning, funding and activities have largely remained a City-led function, rather than being dispersed and controlled at the local level. Since Federal CDBG funds are currently the primary funding source for locally-driven equitable economic development and these resource have typically been allocated directly to City agencies, there has been little left over for communities to access the resources they need for grassroots economic development efforts. We need to begin by making a strong compelling rationale for the field of community development. There is little quantitative or qualitative data that speaks to the widespread impact of equitable economic development efforts. We must re-emphasize locally-driven decision making. Community organizations want and deserve a seat at the decision-making table. Time and again they have demonstrated the capacity to improve communities but need the resources, technical assistance and support to be effective. Fractured decision making among public agencies right now is the rule, not the exception when it comes to neighborhood-based economic development policies. We need consolidated decision-making authority at the city level. Community development organizations have to move beyond CDBG as a source of funding and look to new sources of sustainable economic development funding. Those source include but are not limited to CRA investments, EB5 investments, New Markets Tax Credits, Special Assessment Districts (such as Business Improvement Districts) and other privately funded resources. The community development field is evolving, and this report provides the starting point for practitioners to come together and inform a new direction and resource allocation decisions.